NARO HISTORY: TURMOIL AND TRIUMPH IN BEATING THE ODDS FOR THE “LITTLE FOLKS’ OF THE OILPATCH. 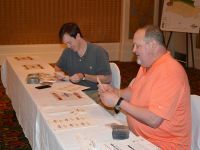 Editor’s note: This article was written by James L. Stafford, the founding president of the National Association of Royalty Owners. Stafford served as NARO’s president from 1980 until March 2000. Prior to joining NARO, he was a professional in mass communications for over 35 years. Before assuming the full-time NARO presidency in 1979, from which he retired in March 2000, he was Executive Vice President of one of the world’s largest public relations firms, ICPR. He had been an author, newspaper correspondent, magazine editor and public speaker. He was the first chairman of the public education committee of the Oklahoma Energy Resources Board. He became heavily involved in Oklahoma’s energy picture as a volunteer advance man, handling national media, during the Oil Caravan to Washington protest of the Windfall Profits Tax. Months later, at the urging of both independent and royalty owners, he founded the National Association of Royalty Owners. He was both a royalty owner and working interest owner in oil and gas production. 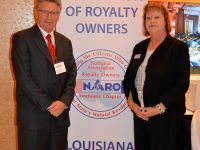 The National Association of Royalty Owners was officially formed on a rainy, sultry day in June of 1980 at a meeting of nearly 500 irate royalty owners from ten states at the Lincoln Plaza Hotel in Oklahoma City. Little did I know that I had a tiger by the tail and couldn’t turn loose for the next 14 years of my life. These owners of production from oil and gas, including myself, had just been hit with a federal tax on oil that would cut many incomes by up to 70 percent. This levy, the so-called windfall profits tax, was aimed at the major oil companies but ended up hitting small producers and royalty owners the hardest. I rented the hall, manned the phones, sent out a flurry of news releases and had recruited several friends as speakers -- including a New York industrial psychologist who dealt with government issues. We also recruited the leader of the newly-formed “Widows on the Warpath,” a royalty group formed in Dallas by the late Gwynne Gazzaway; leaders of the Tennessee Oil & Gas Association; and our future legislative counsel, Attorney John Marsh, a former White House chief legal counsel who I’d met during the Ford Administration years. Marsh had international stature and would resign from NARO activities several years later in order to accept the post of Secretary of the Army. He was the first in a series of super-stars who would help NARO’s influence spread far and wide. CNN, the newly-formed Atlanta-based TV news network, was contacted and a friend, Ed Turner, a former Oklahoma City new director at Channel 4, assigned two-hour live national coverage of the proceedings with a Dallas production crew headed by Clyde LaMott, Jr., whose father was then head of the National Stripper Well Association based in Tulsa. Media interest grew heavy. These included the wire services, both Oklahoma Metro dailies and individual papers from Michigan to California who called to do advance stories and ask for any post-event news releases by telegram. As word spread of media interest surrounding the meeting, I quickly became the most popular guy in Oklahoma among TV-hungry political office holders and candidates. Don Nickles, Bob Kerry, Jr., Governor George Nigh and leaders of the American Agricultural Movement all were wedged into the program on that epic day. Since their bosses were under heavy fire for letting the tax slip through Congress, staff members of the U.S. Senators and Representatives from Texas, Oklahoma, Arkansas and Kansas all took frantic notes during the proceedings. Royalty owners arrived by bus, pickup truck, airline and a few by chartered jet. This was a slight indication of the economic and geographic spread of the nation’s royalty owners, their confusion over who to blame for the tax and their passion to find a way to fight back. The meeting was a rousing success, as the NARO founders unveiled our plan to fight back. And the politicians used their A-Class material to woo the irate crowd with pledges of Herculean support. My cold-water immersion into the anti-tax fray had actually begun several months earlier, before the tax was passed. I was “volunteered” to be the “advance man” for the “Independent Producers’ Caravan to Washington,” as it was later billed, by recommendations to organizers from a number of friends among the Washington Press Corps, and some public relations pros working in Dallas, Tulsa and Nashville. Bud Stewart, an oilman from Muskogee, was the brains behind the caravan along with U.S. Senator Henry Bellmon. Stewart had recently formed the Energy Consumer and Producers Association, based in Seminole. I’d known him briefly when he served in Washington -- then my home base -- as an aide to Bellmon and as a member of the elite “Oklahoma Club,” which consisted of top names in government, law and public relations, all with Sooner State backgrounds. Actually, I hated the initial idea, having personally been subjected to the American Ag Movements’ earlier march on Washington -- which turned the city into a shambles and branded farmers with un-deserved public and media criticism. My weekly commute to ICPR’s New York offices, which I was running at the time, was blocked by tractors at the airport, and it took a two-mile hike to reach my Washington office. Stewart, in an Oklahoma City meeting, overcame my objections -- assuring me of choir-boy behavior from the group -- and said “it would take a week at most.” He also employed overwhelming flattery -- for me a sucker punch. Thus began a terrifying tale of being Mother Superior to a group of likeable but rough-hewn oil patch workers who began the trip with little knowledge of its motives and a general dislike, in the following order, of hippies, government workers, politicians and Yankees, as they called everyone living north of Tulsa. That included just about 99 percent of Washingtonians. I worked two days ahead of the caravan, then was flown back for nightly “Manners Lessons,” as they came to be known, with the caravan drivers, to prevent mayhem, riots and arrests upon arrival in Washington. This ended in a Nashville showdown where we had to have a “silent offering” collection of guns, since a magnum side arm was considered an essential to every truck driver working the area. Unfortunately, D.C. law equated a gun with killing, rather than survival. With help from Stewart, we quickly assembled fact-sheets, briefing books and statistics for media use. During the interval, Alan Petzet, then oil reporter from the Tulsa World, had been filing daily dispatches both to his newspaper and to wire services on the caravan’s progress, as more and more oilmen along the way dispatched heavy rigs to join the march. Petzet got called back to Tulsa from Memphis to cover the business desk for its flu-stricken editor, Riley Wilson, and I inherited the job of Oklahoma media, servicing the wires and broadcast outlets plus staging events and ensuring local TV and photo coverage in cities on the path. Eighteen-hour days became common. And the one week stretched into seven. When the entourage reached the Virginia border, I jumped ahead to Washington and began advance work with old contacts, employees and friends to ensure quality coverage and clearances. This included a daily summary for AP and UPI, most major dailies of the Southwest with bureaus in Washington, plus the networks -- including several shots on the Today Show -- which, thankfully, gave intensive coverage to the issues involved instead of the theatrics. I also wrote and laid-out several half-page ads for the anti-oil Washington Post. About 200 oilies manned our mall display as model citizens. All we asked, offhours, was: “take a cab to Virginia for entertainment, avoid the District.” Thankfully, no incidents occurred, officially. Disquieting news seeped into my mind as I met with leading trade association officials from the independent producers and major oil companies. As a royalty owner, I’d noticed some overt exclusion from key conversations. As I later learned, some high class poker was being played in the Congressional corridors, and it had to do with tossing royalty owners to the tax lions as a sacrifice to keep taxes lower on the majors and independents. To put it politely, I was hopping mad. I took this news to some friends among top Congressional staff members who ducked the issue and started urging that, “somehow, someone must get us some facts on royalty ownership.” Every trade association in America -- about 4500 -- has detailed statistics they can cite in a split-second to defend themselves from federal marauders. Royalty owners had nothing, except some invalid generalizations made by the giant Texas-based Texas Independent Petroleum Royalty Owners (TIPRO), who represented royalty owners more in name than in spirit in those years. Even they had no idea how many of us existed – which became the first order of business for NARO the following year. To set the record straight, this tax-related poker game was being played by Washington legal representatives of the major international oil companies, along with the trade association heads of the various other energy groups. The rank and file members of these groups would have likely been repelled at the tricks being played which eventually led to both royalty owners and the small independents being tossed to the wolves, as the big bankrolls of the international companies provided major congressional leverage against the thin-budgeted small producers. That’s simply how Washington works. Then and now. And why President Jimmy Carter, despite our efforts, signed the Windfall Profits Tax into law. After arriving back in Oklahoma, I was asked to meet with several farm and ranch groups and the head of a western Oklahoma royalty owner’s association -- the late S. G. McLaury, who’d been single-handedly fighting for fair play at the Oklahoma statehouse for nearly a decade. McLaury, a petroleum landman and rancher, urged a statewide meeting and the formation of a national association, since our pleas for help from other existing organizations were being ignored. The conventional answer by TIPRO and others was: “you let us do the talking, and we’ll take care of you.” They made no attempts to get any facts, and the handwriting was on the wall: get the facts and get‘em to the people who talk to the nation. That meant media, Congressional Staff and state governors. My heart went out to the elderly victims, and the more I learned the more determination I had to fight back, alone if necessary. For years, the royalty owners of the nation had largely left their fate to the independent producer trade groups, who they’d joined with early in the century to protest the steel-grip of the railroads who controlled access and pricing in the oilpatch. Some East Coast railroads had controlling ownership of the biggest oil companies. Eventually, the royalty owners became ignored, except when convenient. As a result, the laws of most states were not overly sensitive to royalty owners, and they were considered the poor relations riding in the back of the energy bus. That changed with the formation of NARO -- considered an upstart by some trade groups, and an insult by the well established associations, who were more concerned with their golf scores than “little folks” economic flameouts. As fate would have it, I received a phone call early one morning from key staff members of Lloyd Bentsen and David Boren. They had just talked with the Louisiana Congressional delegation and their offices were being swamped with hostile letters from the nation’s royalty owners who’d just received their first windfall profits tax-impacted run checks. “We need to set-up Senate field hearings in Oklahoma City, Austin and somewhere in Kansas. Can you help?” came the plea. Obviously, the royalty rebellion had begun. And like it or not, it was being dumped in my lap. The first hearing was set at Oklahoma Christian College, one of my public relations clients for several years. Friends in Austin scheduled the massive basketball arena at Texas University. Bernie Nordling, head of the Southwestern Kansas Royalty Owners Association which later became a NARO affiliate, took over in Kansas, working with U.S. Senator Bob Dole’s staff. At the time, due to a growing number of speaking requests, and as very possibly the only central source of protest in the nation, we’d accumulated a fairly good stockpile of royalty owners willing to testify at a public hearing. Newsweek and other national media covered Oklahoma City, and my speech had the best documentation, so received the widest coverage. In Austin, we had carefully selected elderly royalty owners for the podium, reading from texts prepared in Ada. They stole the show. On the perimeter of the arena were royalty owners in wheelchairs, with nurses in attendance, culled from Austin nursing homes and provided free transportation. Television’s harsh eye took it in -- and the message was beamed through the nation by network feeds Clearly, Congress had fired at one wrong target. The legendary “good ole” boy spokesmen of the Texas “oil-patch” were badly upstaged, knew it, and cut their jokes short. The phone began to ring off the wall in Ada, where I’d established an office with an ex-political columnist for the Tulsa Tribune, Kyle Goddard, as assistant. The public hearings erupted in passions at near-lynching level, and Senators Boren, Bentsen, and Dole, along with Russell Long of Louisiana, were mistakenly charged by speakers with creating the whole tax mess when, in truth, they’d been almost the lone opposition. “Get us some facts, Jim, quick,” said Senator Boren, who later linked NARO with several first-purchasers among oil companies to arrive at demographic data. “”You have to start a national organization,” came from Governor Nigh and others now facing shortlived political careers. Immediately following the Lincoln Plaza meeting, we approved a NARO charter, named a board of directors and picked the man to become the first executive director, Jim McKeown, who headed the Oklahoma Independent Bankers Association -- a group I was then working with on a state-wide institutional advertising campaign. McKeown looked at the deal. Refused, based on his salary needs and existing comfort level. “Can you take over for six weeks?” came the challenge to me from then Oklahoma State Senator Tim Leonard, now a federal judge. Agreeing, I also was elected first chairman. The six weeks has stretched to 14 years, and with each month our first battle has paled beside the mountain of issues NARO is involved in today. Meetings in Oklahoma City or Tulsa were held weekly. I traveled to New Mexico, Tennessee, California, Arkansas, Louisiana and Texas to get support and speak - - largely before farm and ranch groups. A battle plan was formalized with media veteran Goddard, Bill Goodwin, a Washington veteran then heading the Tennessee Oil and Gas Association, plus valuable strategy insight from many Congressional offices. Besides John Marsh, our Washington legal expert, we linked with Hank Hankla, a Beaver County, OK, native who was also a mad royalty owner. Hankla, a skilled Washington attorney, was young, aggressive and about the only person east of the Mississippi that thought NARO stood a chance of ever winning any form of exemption from the tax. Tom Donnelly, a Princeton grad, former executive vice- president of the U.S. Jaycees, unsuccessful candidate for Congress and later Energy Special Assistant to President Reagan -- rounded out the roster of our paid consultants in Washington. We’d joint-ventured many projects in the past for TWA, Campus Crusade, API and Holiday Inn and other regional royalty owner groups that had begun to organize in the mid- 1970’s. These were quickly brought in as “affiliates” to enlarge our grassroots base of activists and enhance our influence on Congress. Later, the Illinois Royalty Owners Association and West Texas Mineral Owners Association would merge into NARO, as did the Western Oklahoma Royalty Owners -- the Nation’s oldest and largest. By then, NARO was on the ground and running with the wind of political change. We’d compiled some mailing lists, started the first issues of a newsletter, called ROAR, and were blanketing the nation with information. By trickles at first, then by a surge following the Austin hearings, the memberships came in. “You do the fighting, we’ll collect the money,” came the as-yet unfulfilled promise of many. Our first official office, however, was in Tulsa for several months, where ample space as donated in the downtown Thompson Building by a magazine publisher, with volunteer labor plus two paid facilitators who were to get a solid Tulsa membership base. I was working on a major project for a Tulsa medical publishing and training client, CSI, at the time and the stretch between Ada and my recently deposited family, tired of moves from Chicago to Connecticut, then Virginia, rebelled at my five-day swings between Dallas, Tulsa, Washington and Oklahoma City. The Tulsa base did have advantages. We established strong links with Tulsa University; created a good identity with local oil companies; and renewed old friendships among the editorial staff at the World and Tribune, who were very helpful in getting us needed statistical data -- even to the point of a survey to back our demographic assumptions. Clearly, I had to move it all back to Ada. In the early 1980s, the Ada office was staffed largely by local volunteers, including June Matthews, Melba King, Murrelle Mahoney, the Jay Galvins and others, plus a paid staff of two, including myself, who had then been converted into the hired gun. Our carefully tested “Unite and Fight Back” campaign was deceptively simple, but it was based on exhaustive research among all the companies we could find that would cooperate. Oil companies are as secretive about their royalty owners as they are about a wildcat. In most cases, it took leverage from Congressmen and Senators to get us the facts on who royalty owners were, where they lived and how much they were paid. Banks were also a sound source in building our case. In brief, we soon published a brochure, called “Oil Tax Victims,” using the newly acquired data. The cover showed the nation’s typical royalty owner -- a photo shot by the Tulsa Tribune at a rally we staged on the TU campus -- of a madder-n-heck elderly woman. The brochure had photos of black royalty owners, farmers standing by idle pump jacks and a state-by-state breakdown of royalty ownership extrapolated from every source we could find. Other facts also struck a solid note with politicians. The average royalty owner was retired, or nearing retirement. Well over half were women. A large percent were in nursing homes or bedridden. Most importantly, only one percent had incomes equal to a U.S. Senator. The average income? About $300 a month, even in production-heavy West Texas, which was sliced dramatically with the tax. Over 2.5 million royalty owners existed, a fact never before known. Today that has jumped by 1.5 million, owing to deaths which create even more fractional interests. These brochures were hand-carried into every Congressional office to dispel the “Fat Cat” image that had cost the royalty owners so dearly. Back home, Kyle Goddard was backstopping media queries. I was doing regular interviews with the Louisiana and Texas State radio networks and we were gaining the respect of both independents and majors, as we began also to plead their case for survival. The advertising and public relations accounts I’d brought from my Washington and New York days were largely resigned as the days and nights grew more hectic. Within months, our clipping service bills, based on a per clip basis, per newspaper, were becoming staggering, so we had to cut off the service. As our Washington bills mounted, we had to also cut costs in Ada, so Goddard was cut loose to return back to Tulsa. The turning point of our windfall profits battle came at a cocktail party attorney Hankla and I crashed in Washington D.C. It was to honor Illinois Congressman Dan Rostenkowski who then, and now, hates anything connected to oil. We found a highly incensed Rostenkowski, who had been spurned that day in a floor fight with Democratic leadership of the House Ways and Means Committee, and the entire Texas and Oklahoma Congressional delegation. A tax bill was pending, and every oil state lobbyist was working the halls. All had been excluded from the cocktail party in the Longworth Building. Zeroing in on U.S. Representative Jim Jones, of Oklahoma, later to become Ambassador to Mexico, we learned that the southern conservative Democrats were forming a coalition called the “Boll Weevils” to unite to defeat the windfall profit tax. “Would you call off the dogs if we could get you a one barrel a day exemption?” came from Rep. Ken Hance of Texas who, like the others, was taking a daily beating from phone calls and letters that were largely incited by NARO’s growing band of members. Hankla and I huddled. “Beats nothing, and then we get a wedge and go for total exemption,” he said. Agreeing, we met with about 12 of the Congressmen, and they bided their time until Rostenkowski had fortified himself amply at the watering hole. “We may have something,” confided Rep. Wes Watkins, asking us to put together “numbers” on an exemption by early next week to back their case. Hankla took me to the airport and worked around the clock on admissible evidence proving a one-barrel exemption would help the most battered of elderly royalty owners and prove a relatively small hit to Rostenkowski’s budget. Wes, then an Adan, called at 5 a.m. the following Tuesday from Washington. Hankla had worked all night with the Oklahoma Congressman and a battery of tax wizards to provide an exemption bill. The Treasury boys were called. They sanctified the NARO numbers. I immediately went back to Washington, worked the tax-writing Congressmen and was in the U.S. House Gallery with Lou Watson, Wes’s wife, when the first victory was forged. It was classic little-dog beats the big-dog story, proving creative confrontation, sparingly used, can still win out. Later, we would mount a costly federal court challenge of the tax with a Kansas City law firm before winning our second barrel exemption and then repeal.